When you are a freelancer, you are your own boss — no one tells you what to do and when to do it. This may sound alluring, but there are downsides too. Even though you have the freedom to set your own work schedule, you still have to figure out how to manage your time effectively. If you don’t, your productivity can drop drastically, which affects your profits. This is where time tracking comes in. This article helps you understand the benefits of time tracking and choose the right tool to keep your freelance work on track. Let’s look at some of the reasons why you should track your time. Reason #1: Time tracking helps you plan better. As a freelancer, you don’t always know how many projects will come your way at any given time. Sure, you can decide that you’ll take on new projects only when you are free. But what if you know that a particular project would be a great addition to your portfolio? Is it worth taking it on even if you’re already busy? Time tracking would help you figure out how much time you are spending on your current projects and whether you can make adjustments to accommodate a new project. Reason #2: Time tracking allows you to bill accurately. When you have multiple clients and tight deadlines, it’s easy to forget exactly how much time you’ve spent on each project. This means that when it’s time to bill your clients, you need to do some guessing. You probably already know that’s not the best approach, because it can lead to either underbilling or overbilling your clients. When you underbill, you don’t get compensated fairly for the long hours and hard work that you’ve put in. When you overbill, clients feel like they got a bad deal, which will hurt your future business opportunities with them. Tracking time will allow you to capture the exact hours you’ve worked and make sure you get paid what you’re worth. It also ensures that your clients get billed fairly. And if a client ever does dispute your hourly billing, your time record is there to back you up. Reason #3: Time tracking helps you set the right expectations for future projects. For service-based projects, clients typically ask for a rough estimate of the time it will take to complete the project and what it will cost them overall. Chances are, you’ve done this for projects in the past. When you keep a log of the hours you spend on your projects, it can serve as a good reference point to help you provide an accurate estimate of the time and cost for new projects. This not only prevents you from overcommiting and burdening yourself with a workload you can’t manage, but also helps you set the right expectations for your clients. What is the best way to track time? There are many ways to track your time. Many freelancers take the simple approach and use a stopwatch, then capture their hours on paper or in a spreadsheet. The problem with this approach is scalability. When you have dozens of projects and clients, it is easy to lose track of details like which time entry belongs to which project or which time entries you have already invoiced. Besides, this system requires updates in multiple places and a lot of manual effort. * Track time the way you prefer. A good time tracking system gives you the option to either start a timer when you start work, or log time manually for tasks that you’ve finished. It’s best if you have the option to capture time entries from any device, like a smartphone, laptop, or smart watch. * Bill without any data entry. 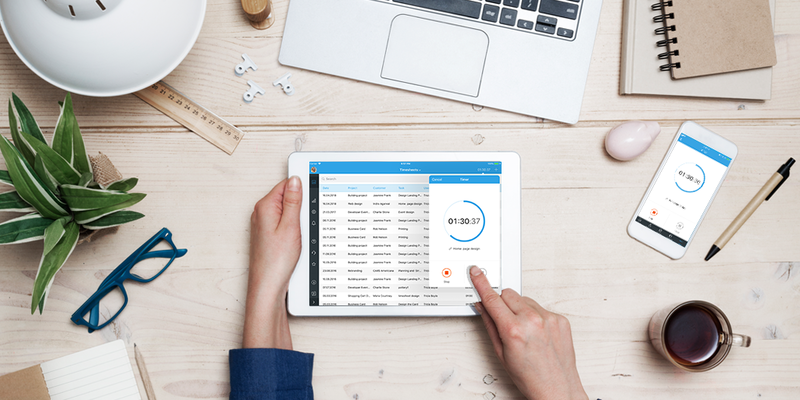 The best time tracking system will reduce manual work for you. When it’s time to bill your clients, you should be able to pull all your billable hours into an invoice automatically. If you have any expenses that need to be billed to the client, you should be able to add them to the invoice too. * Set budgets based on hours or project costs. If your clients give you a budget — based on either cost or time — within which you are expected to complete the project, you should be able to plug it into your software and track how close you’re getting to that limit. * Get a bird’s-eye-view of your projects. An effective time tracking system shows you how all your projects are progressing. You should be able to compare budgeted and logged hours for any project, and easily see how many hours have yet to be billed. * Share your progress with your clients. Clients appreciate transparency. If you want to show them how their projects are progressing, you need to have an easy way to share your project details. The best time tracking system will allow you to share project details automatically through a client self-service portal. Simplify online invoicing. Try Zoho Invoice today!